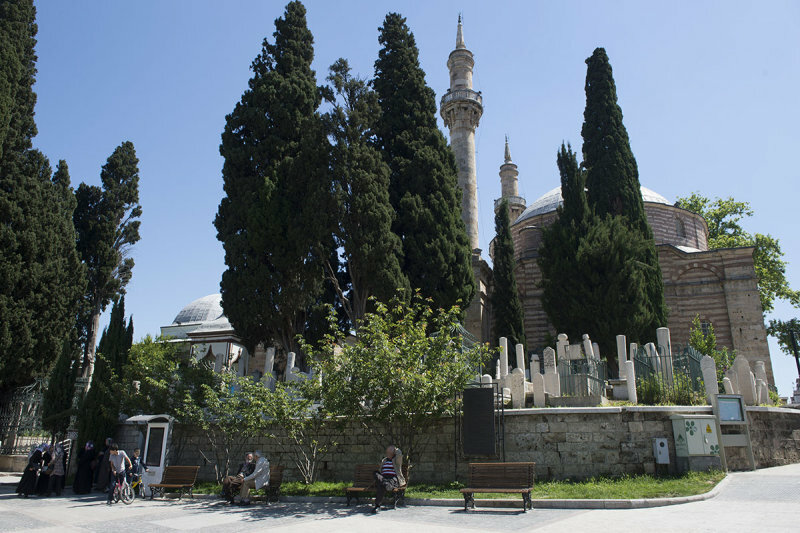 To the west of the mosque, there is a small graveyard with cypresses. It contains the grave of Hocazade Müslihiddin Bursavi, who was sent to Bursa as a müftü (Islamic scholar who is an interpreter or expounder of Islamic law) after he had been a teacher to (the future) Sultan Fatih Mehmed II. The müftü died in 1488. On the right side of the picture: the mosque with its dome and two minarets. On the left side: the cupola of the türbe (mausoleum). Source: ‘Vakıf Abideler ve eski Eserler’ - Vakıflar Genel Müdürlüğü III, Ankara 1983 .